Message on printer says maintenance kit end of life. Can't find replacement to purchase on your website. Please advise. Thank you for your question. Im afraid we dont seem to have a maintenance kit for this printer. I am considering upgrading from a colorQube to a Versalink C500. Is it also wax based ink? The Versalink C500 is a laser printer and uses toner rather than the wax based ink products the ColorQube uses. The Xerox Versalink C500 is a fast and efficient printer that has a recommended monthly print volume of up to 8,000 pages, which is perfect for a busy office that prints large volumes each week. Printing in both mono and colour, the Xerox C500 can handle up to A3 sheets of paper, making it a good choice for companies that produce their own posters and other marketing materials. The duty cycle of the Xerox Versalink C500 is up to 120,000 pages a month, and duplex printing is a standard feature. Connectivity includes Ethernet, USB and Wi-Fi as options. The printer is compatible with a range of operating systems and has several security features that prevent unauthorised access to documents. The Wi-Fi option makes the Xerox Versalink C500 a good choice for larger offices and where people cannot always be connected to the wired network. The addition of mobile print options means that workers on the go can still send documents to be printed, and compatible apps include Apple AirPrint, Google Cloud Print and Mopria. 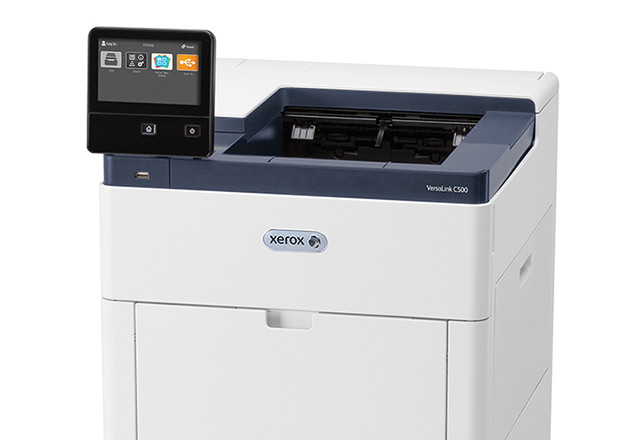 The Xerox Versalink C500 is perfect for the modern office environment where workers are not at their own desk all day. The first page printing time is around nine seconds when printing in mono, which is not as fast as similar models available on the market. The Xerox C500 is relatively large when compared to most desktop printers, and you might need to allow for more space for it. The dimensions are 42.7cm x 46.5 x 44.3cm, and it weighs 27.6kg, so it would be difficult for one person to lift it on their own.